ART56 Glossary is limited to those terms you are likely to encounter when viewing one of the works. Acryl/Oil: A picture/painting painted in a mixed technique of artists' acrylic and oil colours. Aquatint: Acid-resistant particles (e. g. Asphaltgrains) are spread over specific areas of the plate. The plate is then heated so that the grains melt and stick to the plate. When the plate is in acid, this achieves gradations of tones (e. g. light grey up to a rich black) when the plate is inked, accordingly how immensed it was in acid. Canvas: Artists' linen cloth/sheet for painting in acryl, oil, etc. Drypoint: Intaglio technique in which the needle is used to scratch a line onto a plate. The resultant burr of the plate that is raised holds more ink than the incised line itself and gives the typical "shading" of the lines. The plate wears out rapidly because the burr soon breaks off during printing with the etching press. Edition max. 15 impressions. 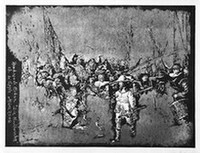 Edition: The limited number of impressions/prints pulled from a plate. e. g. 1/40 is the first print from 40, 40/40 is the last one. Engraving: Line engraving - the motif is incised in the plate with a graver or burin. The depth of the furrow is increased by retracing shallow lines and the burin until the desired depth is achieved. Mezzotint: An intaglio process in which the entire surface of a plate is rocked with a serrated tool to produce a roughened surface that, when inked, yields a rich black. The areas to be white in the print are painstakingly rubbed with a burnisher and an engraver's scraper, which smooth and depress those areas so that they do not take the ink in relief paintings. Monotype: A one-of-a-kind print made by painting on a polished plate and either printed by hand or transferred to paper by running the plate and paper through the etching press. Mould-made copperplate board: (Laid paper) Soft, absorbent paper for intaglio prints, which weighs between 150g/m² - 350g/m². Papiersize: Full margins size of the paper on which the motif/theme (plate-size) is printed on. Plate: A thin (0,5mm - 1 mm), sheet of metal, most commonly used are steel, copper and zinc, that is engraved or etched so as to be printed from. Remarque: Line-etching proofs which are fitted on the edge of the plate. After several experiments a proof sheet will be printed. The plate will now be cutted in its last shape (the edges with etching-proofs are cut away). Since remarque is printed (pulled) before the first print of the edition, it also confirms it as the very first sheet. 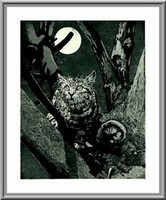 Remarque sheets are for connoisseurs of artists graphics (etchings) very popular because their existence is very rare. Sepia-Prussian blue: Colours which when mixed, give various tone from brownish green up to a dark grey blue. Sheet: Impression's number - 7/40 is the seventh print of 40. Unicum/Unique copy: From artist reworked original print e. g. coloured by stencil or watercoloured. Wood panel: Artists' wood panel, 3-4 mm thick.